A true one of a kind, original concept. 1915 US Army Vampire Killing Kit; antique style hunting and slaying kit by CRYSTOBAL. The legend goes that during WWI, more men were killed by vampires than bullets. The US Army commissioned this kit to be used by Army Chaplains, to rid the field of the vampire threat. 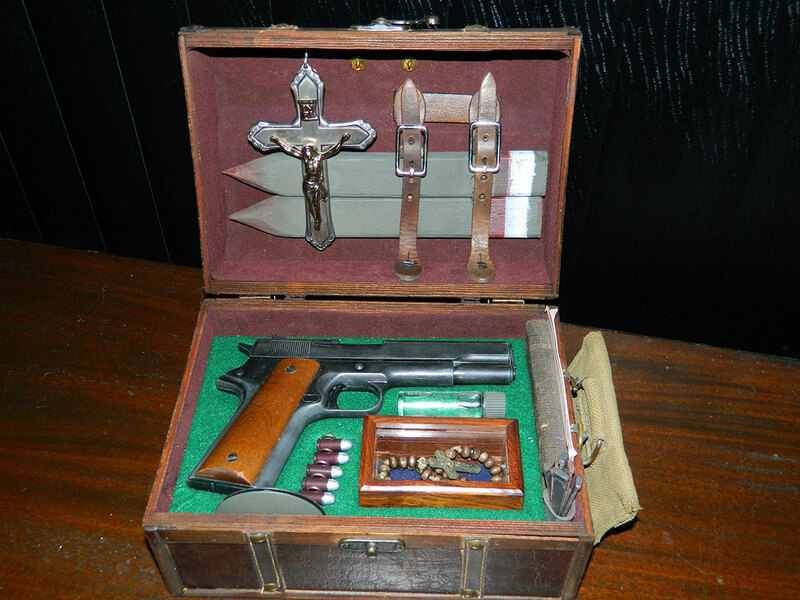 Includes working Colt 1911 .45 auto replica (fires 8mm blanks), stakes, silver “bullets”, metal cross, rosary, holy water, field mirror, and original WWI medical pouch for holding garlic. There has never been a kit built like this before: Beware of any others, they are copies of CRYSTOBAL’s original design. “In 1914, WWI began, and as soldiers fought in bloody trench warfare, the clans of Eastern European vampires found an opportunity to feast like never before. Of the 16 million deaths resulting from this war, over two million have been attributed to vampire attacks. That’s where the US Army vampire killing kit once again came into play. With modern warfare came a modernized VE-77. Equipped with field-tough vampire killing kits manufactured exclusively for them through secret channels, the Chaplains of VE-77 were more equipped than ever to fight against the vampire clans. By 1915 their numbers had increased to two hundred Chaplains, and even though America had not yet entered the war, they were sent to the fronts to protect the soldiers against the vampire threat.